The DC generator converts the electrical power into electrical power. 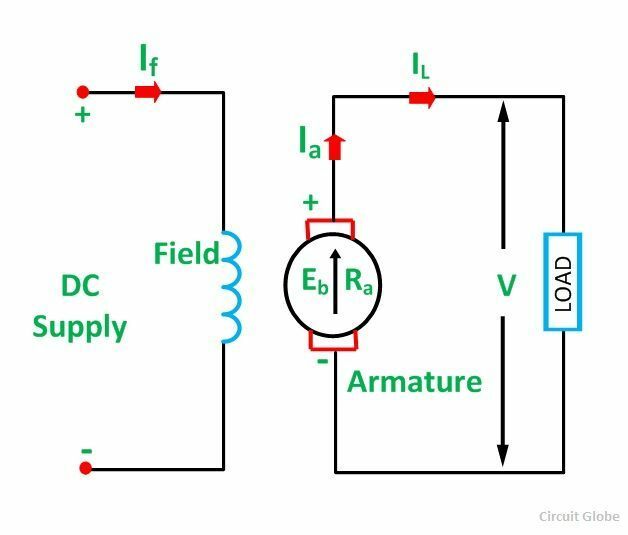 The magnetic flux in a DC machine is produced by the field coils carrying current. 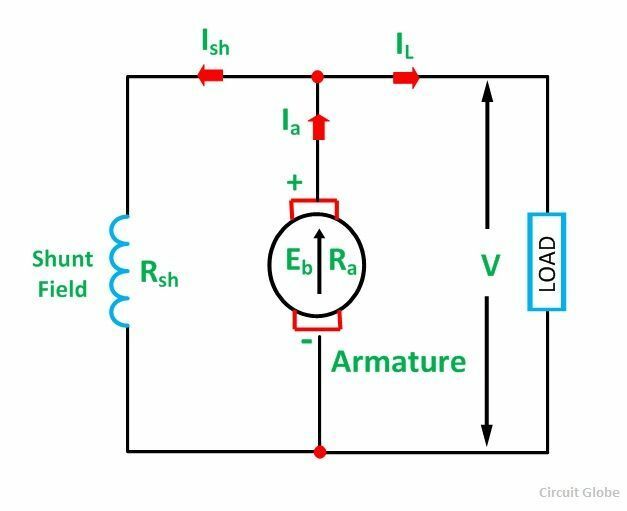 The circulating current in the field windings produces a magnetic flux, and the phenomenon is known as Excitation. DC Generator is classified according to the methods of their field excitation. By excitation, the DC Generators are classified as Separately excited DC Generators and Self-excited DC Generators. There is also Permanent magnet type DC generators. The self-excited DC Generators are further classified as Shunt wound DC generators; Series wound DC generators and Compound wound DC generators. The Compound Wound DC generators are further divided as long shunt wound DC generators, and short shunt wound DC generators. The field pole of the DC generator are stationary, and the armature conductor rotates. The voltage generated in the armature conductor is of alternating nature, and this voltage is converted into the direct voltage at the brushes with the help of the commutator. The detailed description of the various types of generators is explained below. In this type of DC generator, there is no field winding is placed around the poles. The field produced by the poles of these machines remains constant. Although these machines are very compact but are used only in small sizes like dynamos in motorcycles, etc. The main disadvantage of these machines is that the flux produced by the magnets deteriorates with the passage of time which changes the characteristics of the machine. A DC generators whose field winding or coil is energised by a separate or external DC source is called a separately excited DC Generator. The flux produced by the poles depends upon the field current with the unsaturated region of magnetic material of the poles. i.e. flux is directly proportional to the field current. But in the saturated region, the flux remains constant. The figure of self-excited DC Generator is shown below. Ia = IL where Ia is the armature current and IL is the line current. The power developed is given by the equation shown below. Power output is given by the equation (4) shown above. Self-excited DC Generator is a device, in which the current to the field winding is supplied by the generator itself. In self-excited DC generator, the field coils mat be connected in parallel with the armature in the series, or it may be connected partly in series and partly in parallel with the armature windings. In a shunt wound generator, the field winding is connected across the armature winding forming a parallel or shunt circuit. Therefore, full terminal voltage is applied across it. A very small field current Ish, flows through it because this winding has many turns of fine wire having very high resistance Rsh of the order of 100 ohms. The connection diagram of shunt wound generator is shown below. Where Rsh is the shunt field winding resistance. The current field Ish is practically constant at all loads. Therefore, the DC shunt machine is considered to be a constant flux machine. Terminal voltage is given by the equation shown below. A series-wound generator the field coils are connected in series with the armature winding. The series field winding carries the armature current. 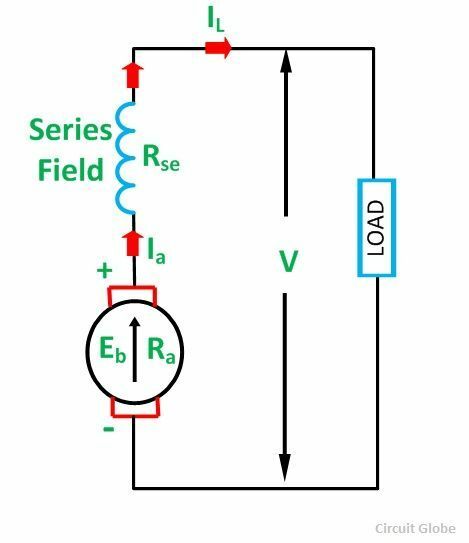 The series field winding consists of a few turns of wire of thick wire of larger cross-sectional area and having low resistance usually of the order of less than 1 ohm because the armature current has a very large value. Its convectional diagram is shown below. Rse is known as the series field winding resistance. The flux developed by the series field winding is directly proportional to the current flowing through it. But it is only true before magnetic saturation after the saturation flux becomes constant even if the current flowing through it is increased. In a compound-wound generator, there are two field windings. One is connected in series, and another is connected in parallel with the armature windings. There are two types of compound-wound generator. For a detailed study of the compound-wound generator, refer the topic Compound Wound Generator. ITS A BEST explanation … ..